The Hottest Of The Short Hair Do's! Changing times lead to changing trends. Gone are the days when those hot summer months forced you to tie your hair into a side knot, away from your face. This fall/winter change your Style and your Hair! People with medium/ long hair can still experiment with several styles. But what about those with short hair cut? Worry no more, we present you the latest hairdos for short hair! Taking inspiration from the ‘60s, The mod-bob is currently the top trend among hairdos for short hair for women. To perfect this look, get your hair styled in a short bob, add a lot of volume and set it the way you want with bobby pins. Take sections of hair on your crown area, comb and tease the roots to create volume. Set your hair with hairspray around the crown area. Decide on a parting for your hair. For a center parting: Comb hair on either side and pull them back. You can then secure the sides with bobby pins, just behind ear at eye level. For a side parting: If you create a parting on the right, pull the hair on the other side behind your ear and secure with a bobby pin at eye level. You will do the same in case you decide on a left parting i.e. pull the hair on the right side behind your ear and secure with bobby pins at eye level. Finish the look by spraying some hairspray to keep the style in place. Bangs go well with almost every hair style and face type! These can be tweaked based on your style and can be used to either create that edgy, rock look or the sweet, romantic look! This is the most popular among the newest hairstyles for short hair. This hairdos with short hair works best when you have straight or wavy hair. It is not about a few strands around your face but thick, big bangs! So if you have thinner hair, the fringe will have to be deeper and start from the crown area to give that depth. This look works best with blunt hair. No layers. The length of the bangs should be such that they are touching the eyebrows or just covering the eyes. Tousle hair to get that messy look and use a hairspray to keep the style intact. 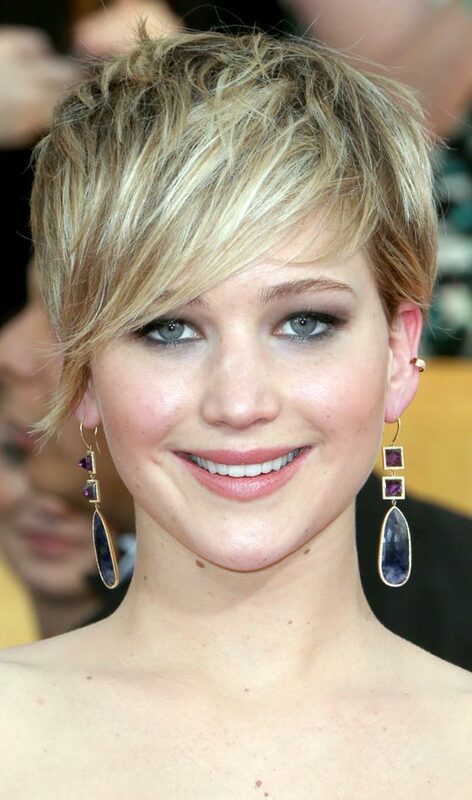 The Pixie Crop hairstyle was a rage in 2011 and is here to stay! It has been slightly altered for this season and has been made even more edgy and grungy! This look involves sporting a pixie crop with very short bangs in the front. It gives you an almost androgynous look and can be combined with dark makeup/ clothes to add that edge to your look! This look is suitable for long/ medium length hair as well as short hair! Now create that perfect hairdos for short hair just out-of-bed look that looks so natural and stylish! Use a volumizing spray to add thickness and volume to hair. Pick out sections of hair and curl them using a curling iron. You need to create big waves/ curls for this look and not tight curls. Move your fingers through the hair for those big messy waves! Secure the style by using a hairspray. Which one of these hairdos for short hair catches your fancy the most? !